(28) Hayashi S, Nishiyama T, Hashimoto S, Matsumoto T, Takayama K, Ishida K, Nishida K, Kuroda R: Risk factors for failure of revision total hip arthroplasty using a Kerboull-type acetabular reinforcement device. BMC Musculoskelet Disord 2017, 18(1):382. (29) Hayashi S, Hashimoto S, Matsumoto T, Takayama K, Nishida K, Ishida K, Kuroda R: Stem anteversion mismatch to the anatomical anteversion causes loss of periprosthetic bone density after THA. J Orthop Surg (Hong Kong) 2017, 25(3):2309499017739478. (30) Hayashi S, Hirata Y, Okamoto D, Kakunai S, Hashimoto S, Takayama K, Matsumoto T, Niikura T, Fujishiro T, Hiranaka T et al: New Proximal Femoral Compaction Blade Provides Strong Antirotation Stability of the Femoral Head. Orthopedics 2017, 40(3):e491-e494. (31) Hayashi S, Hashimoto S, Takayama K, Matsumoto T, Takebe K, Terashima Y, Kuroda R, Sakai Y, Ishida K, Nishida K: Risk factors for late deep infection after total hip arthroplasty in patients with rheumatoid arthritis. Acta Reumatol Port 2017, 42(2):150-154. (32) Hayashi S, Hashimoto S, Takayama K, Matsumoto T, Nishida K, Kuroda R: Multiple Revision Surgeries and Acetabular Bone Defect Size May Predict Daily Activity After Revision Total Hip Arthroplasty. J Arthroplasty 2017, 32(5):1606-1611. (33) Tsubosaka M, Matsumoto T, Takayama K, Nakano N, Kuroda R: Two cases of late medial instability of the knee due to hip disease after total knee arthroplasty. Int J Surg Case Rep 2017, 37:200-204. (34) Tsubosaka M, Takayama K, Oka S, Muratsu H, Kuroda R, Matsumoto T: Posterior condylar offset influences the intraoperative soft tissue balance during posterior-stabilized total knee arthroplasty. J Orthop Sci 2017, 22(6):1071-1076. (35) Tsubosaka M, Matsushita T, Kuroda R, Matsumoto T, Kurosaka M: Pseudoaneurysm of the articular branch of the descending genicular artery following double-bundle anterior cruciate ligament reconstruction. Knee Surg Sports Traumatol Arthrosc 2017, 25(9):2721-2724. (36) Tsubosaka M, Ishida K, Sasaki H, Shibanuma N, Kuroda R, Matsumoto T: Effects of Suture and Tourniquet on Intraoperative Kinematics in Navigated Total Knee Arthroplasty. J Arthroplasty 2017, 32(6):1824-1828. (37) Matsumoto T, Takayama K, Ishida K, Hayashi S, Hashimoto S, Kuroda R: Kinematically aligned total knee arthroplasty: alternative standardized technique? Ann Transl Med 2017, 5(Suppl 1):S10. (38) Matsumoto T, Takayama K, Ishida K, Hayashi S, Hashimoto S, Kuroda R: Radiological and clinical comparison of kinematically versus mechanically aligned total knee arthroplasty. Bone Joint J 2017, 99-B(5):640-646. (39) Takayama K, Kawakami Y, Lavasani M, Mu X, Cummins JH, Yurube T, Kuroda R, Kurosaka M, Fu FH, Robbins PD et al: mTOR signaling plays a critical role in the defects observed in muscle-derived stem/progenitor cells isolated from a murine model of accelerated aging. J Orthop Res 2017, 35(7):1375-1382. (40) Kamada K, Matsumoto T, Takayama K, Araki D, Hashimoto S, Hayashi S, Matsushita T, Kuroda R: Mobile Bearing Total Knee Arthroplasty for Valgus Knee Osteoarthritis with Permanent Patellar Dislocation: A Case Report and Review of the Literature. Case Rep Orthop 2017, 2017:1230412. (41) Kawakami Y, Matsumoto T, Mifune Y, Fukui T, Patel KG, Walker GN, Kurosaka M, Kuroda R: Therapeutic Potential of Endothelial Progenitor Cells in the Field of Orthopaedics. Curr Stem Cell Res Ther 2017, 12(1):3-13. (42) Chinzei N, Hashimoto S, Hayashi S, Kanzaki N, Araki D, Kuroda R, Kurosaka M: Consecutive Bilateral Hip Arthroscopy for Symptomatic Bilateral Femoroacetabular Impingement in an Elite Rugby player: A Case Report. J Nippon Med Sch 2017, 84(6):280-285. (43) Matsuzaki T, Matsumoto T, Muratsu H, Ishida K, Takayama K, Nagai K, Nakano N, Nishida K, Kuroda R, Kurosaka M: The contribution of intraoperative medial compartment stability to post-operative knee flexion angle in unicompartmental knee arthroplasty. Knee Surg Sports Traumatol Arthrosc 2017, 25(1):272-276. (44) Kuroda R, Nagai K, Matsushita T, Araki D, Matsumoto T, Takayama K, Kurosaka M: A new quantitative radiographic measurement of patella for patellar instability using the lateral plain radiograph: 'patellar width ratio'. Knee Surg Sports Traumatol Arthrosc 2017, 25(1):123-128. (45) Matsushita T, Watanabe S, Araki D, Matsumoto T, Takayama K, Kurosaka M, Kuroda R: High tibial osteotomy combined with cancellous bone graft and osteochondral autograft transplantation in a patient with massive osteochondral defects in the medial femoral condyle. J Orthop Surg (Hong Kong) 2017, 25(1):2309499016685016. (46) Kawakami Y, Takayama K, Matsumoto T, Tang Y, Wang B, Mifune Y, Cummins JH, Warth RJ, Kuroda R, Kurosaka M et al: Anterior Cruciate Ligament-Derived Stem Cells Transduced With BMP2 Accelerate Graft-Bone Integration After ACL Reconstruction. Am J Sports Med 2017, 45(3):584-597. (47) Inokuchi T, Matsumoto T, Takayama K, Nakano N, Zhang S, Araki D, Matsushita T, Kuroda R: Influence of the Injury-to-Surgery Interval on the Healing Potential of Human Anterior Cruciate Ligament-Derived Cells. Am J Sports Med 2017, 45(6):1359-1369. (48) Kihara S, Hayashi S, Hashimoto S, Kanzaki N, Takayama K, Matsumoto T, Chinzei N, Iwasa K, Haneda M, Takeuchi K et al: Cyclin-Dependent Kinase Inhibitor-1-Deficient Mice are Susceptible to Osteoarthritis Associated with Enhanced Inflammation. J Bone Miner Res 2017, 32(5):991-1001. (49) Matsushita T, Nagai K, Araki D, Tanaka T, Matsumoto T, Nishida K, Kurosaka M, Kuroda R: Factors associated with the status of meniscal tears following meniscal repair concomitant with anterior cruciate ligament reconstruction. Connect Tissue Res 2017, 58(3-4):386-392. 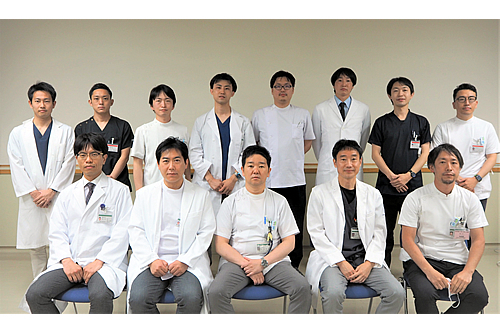 (50) Nishida K, Matsumoto T, Takayama K, Ishida K, Nakano N, Matsushita T, Kuroda R, Kurosaka M: Remaining mild varus limb alignment leads to better clinical outcome in total knee arthroplasty for varus osteoarthritis. Knee Surg Sports Traumatol Arthrosc 2017, 25(11):3488-3494. (51) Ueda Y, Matsushita T, Araki D, Kida A, Takiguchi K, Shibata Y, Ono K, Ono R, Matsumoto T, Takayama K et al: Factors affecting quadriceps strength recovery after anterior cruciate ligament reconstruction with hamstring autografts in athletes. Knee Surg Sports Traumatol Arthrosc 2017, 25(10):3213-3219. (52) Tanaka T, Takayama K, Hashimoto S, Kanzaki N, Hayashi S, Kuroda R, Matsumoto T: Radiographic analysis of the lower limbs using the hip-calcaneus line in healthy individuals and in patients with varus knee osteoarthritis. Knee 2017, 24(5):1146-1152. (53) Nagai K, Muratsu H, Takeoka Y, Tsubosaka M, Kuroda R, Matsumoto T: The Influence of Joint Distraction Force on the Soft-Tissue Balance Using Modified Gap-Balancing Technique in Posterior-Stabilized Total Knee Arthroplasty. J Arthroplasty 2017, 32(10):2995-2999.